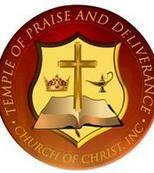 Temple of Praise and Deliverance Church of Christ is committed to winning souls for Christ. We are kingdom builders empowering disciples of Jesus Christ. The Holy Bible is the inspired word of God and is the basis for all statements of faith. We believe Jesus Christ suffered and died for our salvation, and on the third day arose with all power in his hands. He now sits on the right hand of the father as a Mediator for those who love him and keep his commandments. We band ourselves together as a body of believers in our Lord Jesus Christ, committed to sharing the good news of salvation to those that are lost. The ordinances of the church are Water Baptism, Baptism of the Holy Spirit, and Holy Communion.